Paul Weller's choppy fringe might be on the snowier side of silver these days, but the British rocker, who turned 60 on May 25, has never strayed from the brash exuberance that propelled him through his many phases: the Jam, the Style Council, and since 1991, his prolific solo career. His 14th and most recent album (or 26th, counting band releases) is the the gorgeous True Meanings, released in September, 2018. An about-face from the restless upheaval of recent albums like 2012's Sonik Kicks, the delicate True Meanings finds Weller in a mellow, acoustic frame of mind, as on the exquisite "Gravity." It's a quieter place, one that he's traversed for individual songs over the past five decades, but never for an entire album until now. Then again, Weller has never been satisfied sounding the same way twice; the four-word title of the Style Council's "My Ever Changing Moods" is an apt logline for Weller's career. Revered in his native UK as a preeminent rock star, Weller is forever tagged as the "Modfather" (Google the term and a grinning Weller pops up). As a teenager, his affection for the Who and mod subculture and style became, as he's described it, like a religion for the musician. In Britain, Weller is deified for his influence on generations of guitarists and songwriters with shaggy locks and a melodic streak, like his pal Noel Gallagher, who plays harmonium on True Meanings, or Graham Coxon and his erstwhile Blur bandmate Damon Albarn (who memorably paired with Weller on a cover of the Beatles' "Blackbird" in 2016 with the Orchestra of Syrian musicians on that Africa Express tour). Back in 2006, the Brit Awards bestowed a Lifetime Achievement honor on Weller; he was only 48 at the time, and has churned out six more solo albums in the dozen years since. But the legacy of the Surrey-bred Weller, a superb songwriter and guitarist, has been shortchanged in the States; he's far more of a niche cult hero here than a mainstream pillar of rock 'n' roll. While he deserves to be in Bruce Springsteen's stratosphere, the transatlantic disparity isn't too surprising: Weller has steadfastly refused to adhere to rigid American commercial radio standards, eschewing genre boundaries and trusting his own passions instead. As a young man, he could be cantankerous and caustic with bandmates, friends, and journalists; he wasn't interested in playing music industry games. While a keen observer of British life, culture, and politics, he's never really indulged in overtly sentimental nostalgia (he recently declared to The Guardian that he'd never play one of his old albums in its entirety for any gig). Still, his 1995 release Stanley Road, released during the height of Britpop, was inspired by his childhood street in Woking. Last year's A Kind Revolution not only wrestles with temporal questions, but autobiographical love stories too ("New York"). Weller's first band, the Jam, began as a schoolboys' lark in 1972 — until the lads got serious (managed by Paul's dad), were signed by a label, and released their debut single "In the City" in 1977. A debut album of the same name swiftly followed that year too. The core lineup of Weller, Bruce Foxton and Rick Buckler kicked out ebullient punk pop that was acerbic, sometimes brusque, but always melodic. They didn't shy from jagged political critiques, railing against Thatcherism and the Tory government. Songs like "The Eton Rifles," "Scrape Away," or "Going Underground" were aggravated anthems for British youth in the late '70s and early '80s. Weller and his mates were duly championed by the Clash, who took the Jam along on their 1977 "White Riot" tour. Later tracks, like the Motown-grooved "Town Called Malice," from 1982's The Gift and "That's Entertainment" off of 1980's Sound Affects, were hits with a message. "Hey boy," they shout, "have you got any money?" It took a look and drowned me in its own existence. Weller broke up the Jam in late 1982 at the pinnacle of the band's success, a shocking move that estranged him from his bandmates (Weller and Foxton eventually reconciled after a 20-year silence and collaborated on Weller's 2010 album, Wake Up the Nation). Desiring something completely different, Weller sidled into the jazzy, soul and house-infused pop of the Style Council. That band, cofounded with Mick Talbot and eventually including drummer Steve White and singer Dee C. Lee, was even more politically outspoken and enraged than the Jam, but the urgent messages of "Walls Come Tumbling Down" or "Come To Milton Keynes" were sweetly executed with a pillowy, lush, and brassy punch, favoring a smooth Seventies-era Curtis Mayfield or Marvin Gaye vibe (and even a little English music hall). In fact, Weller cited Gaye's What's Going On as critical in the formation of the Style Council, calling Gaye the greatest singer of all time. "His range and control over his voice is amazing," he once told the Guardian. "He raised the bar for me when I wanted to stretch out musically." And it's undeniable that in songs like "Long Hot Summer" or "Shout to the Top" that Weller aimed for his idol's style of soul nirvana. Weller's ardent admiration for R&B and gospel has always been a constant in his repertoire, from originals, like True Meaning's "Movin On" or A Kind Revolution's "The Cranes are Back," to covers, like his ravishing Studio 150 take on the Sister Sledge single "Thinking of You." But his rapt attention to folk, Americana, and his British rock forebears is equally important — Weller even coaxed the Soft Machine's Robert Wyatt, who hadn't performed live since 2000, back to the stage in 2016 for a concert supporting Labour leader Jeremy Corbyn. Some songwriters never get the international due they deserve. While Weller might never sell out an American arena, the vast range of his output is a revelation to anyone discovering his music for the first time. His easy ability to cross generations and rocky political eras with fresh, inspired ideas is a testament to his artistry and songwriting; he's not just aging with grace, but with integrity and ingenuity. 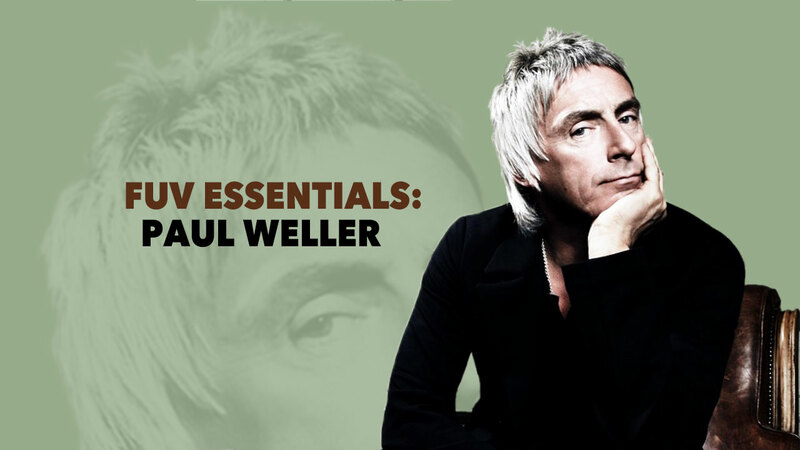 The remarkable Paul Weller, in all of his guises and mutable moods, is one of our FUV Essentials.